25% off closing down sale. Still nonplussed about the interest shown, world wide, in our 'Sheep in the Window' post of 2nd September. 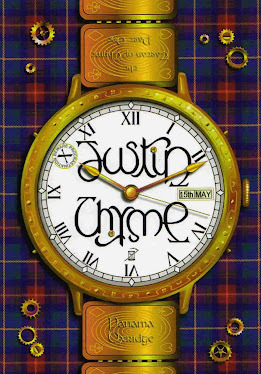 However, I decided to take advantage of it by adding a comment about our favourite book, Justin Thyme and the sequel, Thyme Running Out. 19/11/2012 Sorry, it's no longer available. 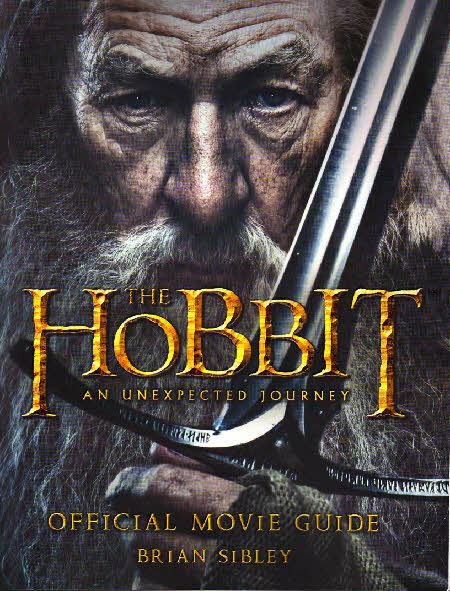 Tony has already booked his family seats for the film of The Hobbit. Indeed, he will be having a Hobbit weekend with the film on one day and a home showing of Lord of the Rings on the next with first and second breakfasts (nice crispy bacon) where he can fit them in. 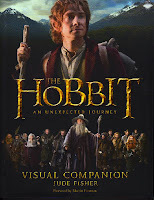 In the shop we have the complete Lord of the Rings and The Hobbit, of course but there are also two great film books. 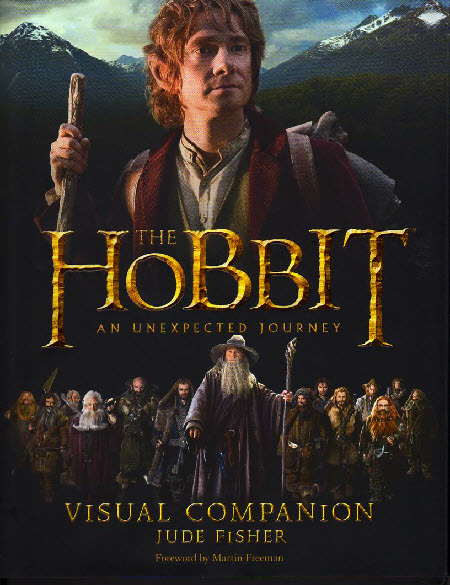 The Visual Companion is a hardback containing copious notes about the characters in the film and plenty of background information with pages devoted to 'Hobbit', 'Wargs' and 'Goblins'. The Official Movie Guide is by Brian Sibley (co-writer of the wonderful 1981 radio version of LOTR among many other treats). This is packed full of great film shots and interviews. Worth it just for the page on 'Dressing Galadriel'. Meanwhile, Tony is waiting to get his hands on the first Games Workshop models based on the film characters. 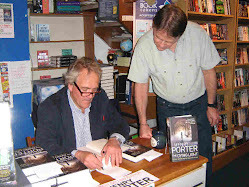 You may remember some excellent poetry recently shown on this blog written by mothball and string collector, John Curtis. Not only is this a wordsmith known all around the world, especially by the police, but he is also an excellent cartoon (ist). 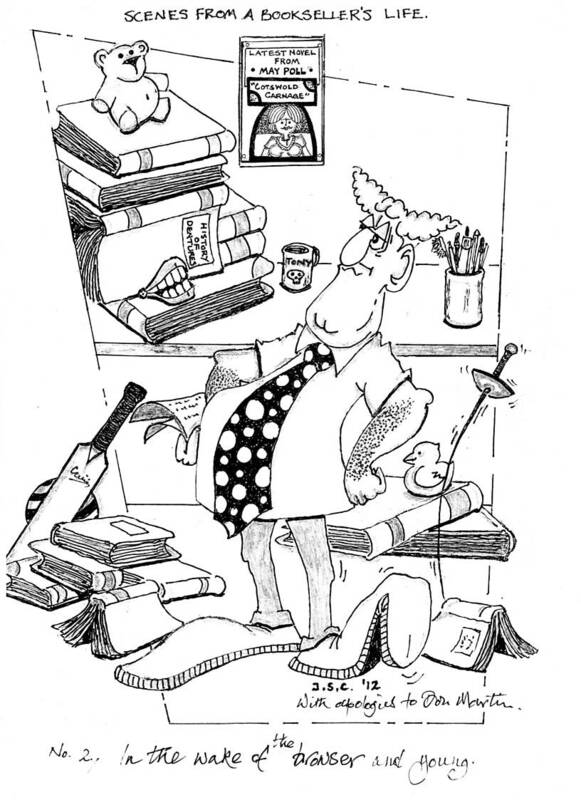 We are proud to show you some of his work, drawn in the style of the late Don Martin especially for Cotswold Bookstore. 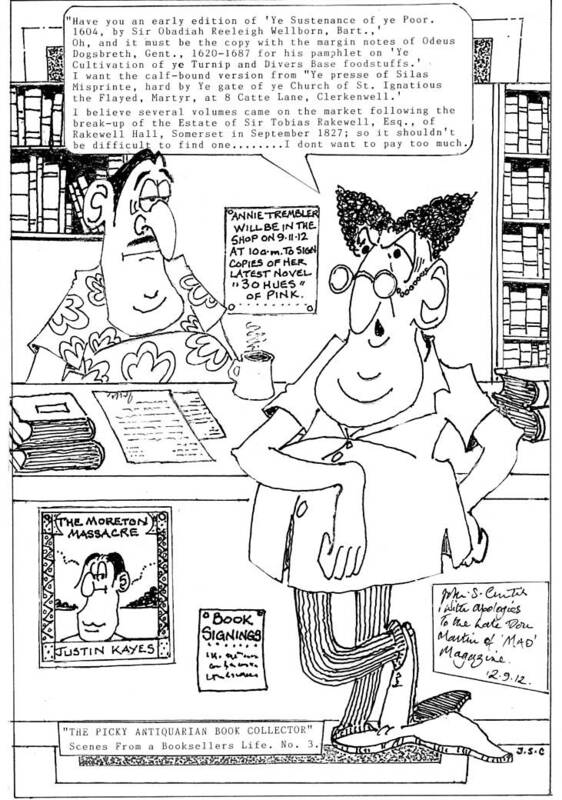 Clicking on the image enlarges it but if you still can't quite get the joke, come into the shop and see the originals on the wall behind the counter. There's only a small charge. Why are so many people looking up our post 'Sheep in the Window'? Please tell. Another special offer to clear down some of our stock is a great deal on classical music from Naxos. 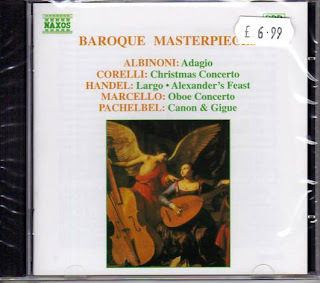 Naxos classical music and Jazz CDs are normally at the excellent price of £6.99 but we have taken the price way back to when we opened Cotswold Bookstore by taking £2.00 off. That's bettered if you buy 3 CDs as there's an alternative 3 for 2 offer on at the same time. 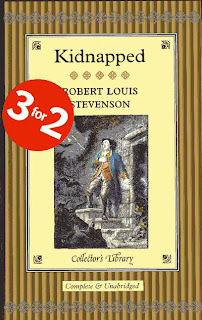 Buy 2 at the normal price and receive the 3rd free. 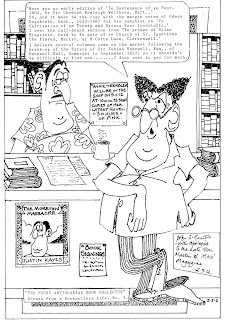 Nearly as good as when Naxos started trading in 1987! 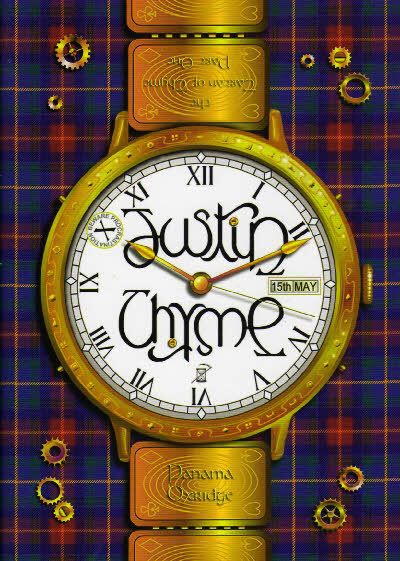 I was surprised, a month ago, to discover a massive number of hits for our post about Justin Thyme Leaflets to the printers (June, last year). Now we have a similar surge for the post Sheep in the Window. To provide a boost to cash flow in the lead up to Christmas we have some real bargains on offer. The sumptuous classics from The Collector's Edition are normally at a crazy price anyway. With quality paper, gold edging to the pages, a silk marker ribbon and often original illustrations, these are bargains usually at only £7.99*. 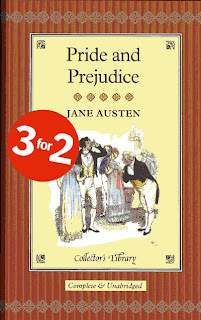 Now we are making them even more of a great buy with our 3 for 2 offer. Shakespeare, Dickens, Austen, Poe, Stevenson, The Brontes, Fielding etc, etc. Hurry though, this offer only applies to the books in stock. So here's that photo. Monty in the snow. 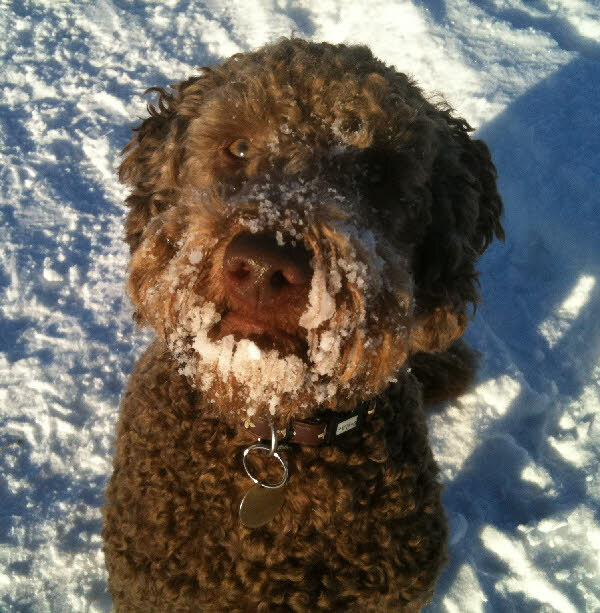 The mystery labradoodle on your blog is me, Monty, short for Montezuma, a local chocolate shop in Chichester. I celebrate my 3rd birthday this Friday, and was pleased to see my portrait on your site, reminding me of a wet but happy week in the Cotswolds. Attached a picture of me in the snow, which I love, last winter. Of course. I should have remembered but I'm bad on names. I was going to ask Nina but haven't seen her for a few days. Great photo, by the way. I'll have to reduce it before I can put it on the blog. I hope there's tons of snow where you live soon but please don't wish any on us. You don't have to clear the drive!